Engaged couples send out dozens of online inquiries during the planning process trying to find the perfect vendor team for their wedding day. 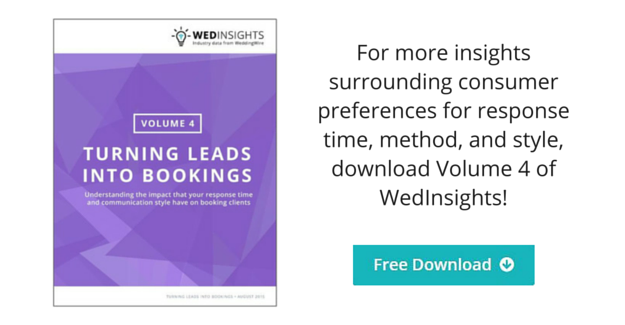 While some couples may know a little (or a lot) about your business prior to submitting a lead, how you respond and the speed of your response will determine the likelihood of booking. Couples have become expert multi-taskers and take every opportunity they have to do wedding research and submit leads – often during work or school. Furthermore, many couples like to have a record of the conversation in their email so they can easily reference it at a later date. Since they won’t always have the time to schedule a phone call with you, make sure you’re responding to inquiries in a way that’s convenient for your prospective client. If they reach out via email, respond via email. One way to increase your likelihood of booking a client is to respond quickly – within 24 hours to be exact. Our data shows that couples have an all-around more positive perception of a vendor when they respond quickly. The faster you respond, the more likely your prospective client is still thinking about your business and will continue the conversation. Think about the leg up you’d have if you’ve already had two conversations before your competition has even replied! Responding to an inquiry with a personalized response could be the difference between winning and losing a client. When a client reaches out to learn more about your business, they want to hear back from you and know that their business matters – they want to feel important. This doesn’t mean that you can’t have a template to help speed up the process, but make sure you take the time to customize it, answer specific questions and get to know the couple. Treat every lead like they’re already your client and you’ll quickly stand out. While we know that couples contract an average of 25 vendors while searching for their team, the way they vet vendors between the inquiry and appointment stages differs from couple to couple. Some couples rely on a few recommendations while others have a more thorough vetting process to find the right professional who will match their personality and attitude. Regardless of how thorough their vetting process is, engaged couples gather as much information as possible before narrowing down the pool to a couple final contenders with which they’ll set up an appointment. As a wedding professional you can maximize your online leads and outshine your competition by responding quickly, making it personal and adjusting to their preferences.